MAX contains the Omega 3 Essential fatty acids (EPA and DHA). However, this is where the similarity ends. 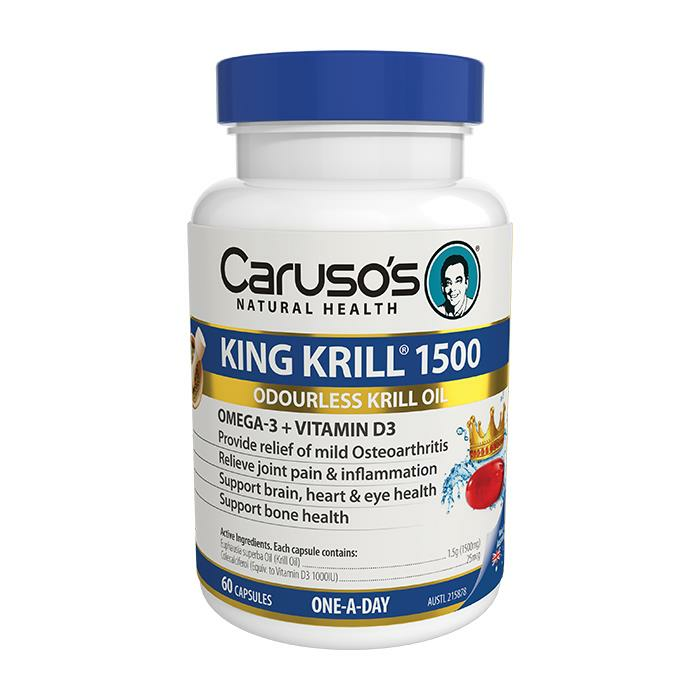 TheUltra Omega King Krill MAX formula is a very rich source of Omega 3 Essentialfatty acids. The red oil from King Krill MAX has a superior phospholipid structure, where as fish oil has a triglyceride form making krill oil more easily absorbed by your body.Better absorbed by the important areas of your bodyThe Omega 3 Essential fatty acids in King Krill MAX are absorbed and carried to your body's cells in phospholipid form. And because Phospholipids are the building blocks of your cell membranes, phospholipids are easily recognised and utilised by your body. Hence the Omega 3 Essential fatty acids in King Krill MAX are highly absorbable by your body. * King Krill MAX 1500mg is triple strength when compared to King Krill 500mg formula. Dosage:Adults take 1 Capsule daily for Arthritis, Cholesterol and General Health and wellbeing or as advised by your Healthcare Professional. : If taking anticoagulants please consult your Healthcare Professional. Caution: Krill oil is derived from seafood. Not suitable for use by those with an allergy to seafood. Caution: May increase the effects of some Cholesterol lowering medications. Caution: Not recommended for use by pregnant or lactating women. Caution: Take at least two hours away from pharmaceutical medication. Use only as directed. If symptoms persist see your Healthcare Professional. Vitamin supplements should not replace a balanced diet. Free from added sugar, lactose, wheat, gluten, corn starch, yeast, corn and preservatives.